Rameau’s opéra-ballet Les Surprises de l’Amour has been one of the composer’s more neglected stage works. In the 1960s Marcel Couraud recorded a dance suite culled from the work (Philips) and in the late 1980s Marc Minkowski recorded a more extensive dance anthology (Erato). Both he and William Christie have recorded Anacréon, the third of the three entrées, or acts, belonging to Rameau’s revised version of the opéra-ballet, but not to be confused with his earlier acte de ballet of the same name (DG Archiv and Harmonia Mundi, respectively), and Christophe Rousset included the Ouverture and a short orchestral excerpt in his anthology of Rameau overtures (Decca). 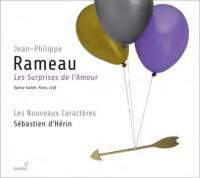 Sébastien d’Hérin and Les Nouveaux Caractères have chosen Rameau’s later version of Les Surprises de l’Amour, premiered in Paris in 1757. The first version had been staged at Versailles in 1748 to celebrate the Treaty of Aix-la-Chapelle. It consisted of a prologue and two entrées, ‘La Lyre Enchantée’ and ‘Adonis’. By 1757 the Treaty was no longer topical and flattering references to royalty no longer de rigueur, so Rameau ditched the Prologue, reversed the order of the two entrées and added a new one, ‘Anacréon’, which was later to enjoy success as an autonomous piece. The librettist for both versions of Les Surprises de 1‘Amour was Pierre- Joseph Bernard, dubbed Gentil-Bernard by Voltaire, who in 1737 had provided the composer with the text of his tragédie-lyrique Castor et Pollux. Further adjustments ensued, mainly concerning ‘La Lyre Enchantée’ , but by 1758, as Sylvie Bouissou, the editor of the score, tells us in her illuminating essay, all was finally in place, and it is this version that is followed in the present recording. Conforming with opéra-ballet tradition, each of the three entrées is an independently standing piece. There is no unifying plot, which perhaps tempts us to undervalue the text. Yet Gentil-Bernard’s words are often evocative and touching, above all allowing Rameau opportunity for the sensitive responses and magical word-painting of which his music is redolent. That is certainly so in the tenderly characterized music of ‘Adonis’, whose title for the 1757 revival was extended to ‘L’Enlèvement d’Adonis’ . This entrée concerns a passionate rivalry between the goddess Diana and Venus, aided and abetted by a mischievous Cupid, for the beautiful youth Adonis. ‘ La Lyre Enchantée ‘ concerns the mythological hero, Linus. Parthenope, a Siren, seduces him notwithstanding cautionary warnings from Urania, Muse of astronomy. Urania in turn feels love for Linus having been bewitched by Parthenope’s magic lyre. Apollo shows up and brings Urania to her senses but both Sirens and Muses at last celebrate love in a sequence of airs and dances. ‘Anacréon’ is the most entertaining of the entrées. Gentil-Bernard’s version of the story is based not so much on the merit of Anacreon’s poetry as on the amorous and bibulous reputation he acquired as a result of his famous love poems. A contretemps between the followers of Cupid and those of Bacchus, representing the respective interests of the chamber and the tavern, takes place in Anacreon’s studio. Following lively exchanges between the two sides, Cupid extends to Bacchus an olive branch: ‘Rule with me Bacchus, share my conquests. ‘The gathered assembly is delighted, ‘Bacchus lets us love and Cupid lets us drink. ‘What a happy ending! Rameau’s score contains a wealth of fine music, much of it forward-looking in respect of style, and little of it identifiable from other sources. An exception is an orchestral reworking of ‘La pantomime’ from the 1741 Pièces de clavecin en concerts. The musicians of Les Nouveaux Caractères play with lively commitment and ready responses to Rameau’s often exacting requirements. The dances are plentiful and of high quality. Especially alluring are a Sarabande gracieux ( Adonis ), a ‘Loure, Tambourin and Contredanse’ (‘La Lyre Enchantée’) and ‘Sommeil, Gigue and Contredanse ‘ ( ‘Anacréon’). Very occasional acidity in the upper string parts did little to dampen my spirits. Less consistently rewarding were the contributions of the soloists and chorus. Amel Brahim-Djelloul in the role of Adonis affords the greatest pleasure. Her youthful sounding and boyish voice well suits the role, as you can hear in the ariette ‘Règne amour’ (track 2 1), but, alas, she does not appear elsewhere in the work. Virginie Pochon, who sings Amour (‘Adonis’) and Parthenope ( ‘La Lyre Enchantée’), is mainly effective, though her vibrato is on occasion too pronounced. That problem, though, is almost unacceptably persistent in the singing of Caroline Mutel as Venus (‘Adonis’) and Cupid (‘Anacréon’). It spoils Rameau’s splendidly athletic ariette ‘Règne avec moi’ and this is a great pity. There is plenty of characterization in the singing of Karine Deshayes as Diana (‘Adonis’), Urania (‘La Lyre Enchantée’) and La Grande Prêtresse (‘Anacréon’). Her ‘Douce volupté’ (‘La Lyre Enchantée’) comes over well in one of the scenes rich in word painting. Anders Dahlin makes an eloquent Linus (‘La Lyre Enchantée’) and his lightly articulated declamation is clear and appealing, though he is not always comfortable in the uppermost reaches of his vocal range. Jean- Sébastien Bou is disappointing as Anacreon. His singing is not clearly focused and his intonation is unreliable. The 13-voice choir is spirited and alert and if it is not invariably tidy in ensemble and polished in texture it often compensates for under-characterization in the action. That is especially so in ‘Anacréon’, whose text invites rather more levity and fun than is communicated here. 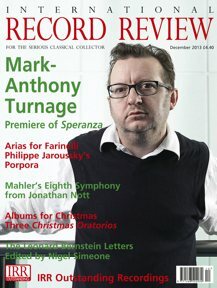 Even so, d’Hérin directs all with energy and understandable enthusiasm for some rarely heard rnusic.